HENRY VICARYE. If, as seems likely, his daughter Charitie was born in the 1560s, then Henry’s birth may have been around the 1530s. In the 1569 Muster Roll for the North Devon village of Rose Ash, Henry Vicarye appears as a harquebusier. The harquebus was an early type of firearm. It was about 3ft long and weighed around 10 lb. It was fired by applying a lighted wick to a pan containing gunpowder. Heading the roll is William Vicarye, who is the first named of four presenters of the roll. He is probably the same William Vicarye who appears as one of those specially charged to provide arms. He is listed as G6, which meant he had goods valued between £20-40, and must supply 1 almain rivet, 2 bows, 2 sheafs of arrows, 2 steel caps and 1 bill. In addition, he was ordered to supply 1 caliver and 1 murrion. William was thus one of the most important and affluent parishioners. He is probably Henry’s father, though he could be his elder brother. 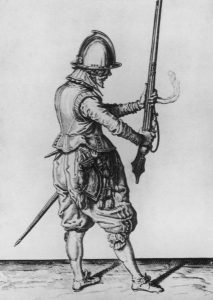 A William Vicarye is also listed as an archer. This may be the same as the presenter, if he was still able to bear arms. Or it could be his son, in which case, he would probably be Henry’s brother. There was considerable controversy at the time about whether guns were better than bows. There would have been some family rivalry over this. The harquebus had a range of 20-50 yards, while a trained bowman could manage 150 yards, and fire more shots a minute. The less affluent parishioners also had responsibilities for equipment. The Muster Roll for Rawes Aishe states that: Thinhabitants not particularlie chardged by the Statute are accessed to fynde and manteyn one corselet, one pike, one caliver, one murrion. The corselet was light body armour consisting of a metal breastplate and backplate, strapped together, and sometimes with a collar and metal apron. The pike had a 15 ft shaft and a metal spike. The caliver was a development of the harquebus, between that and a musket. The murrion, or morion, was a helmet with a central ridge and a narrow brim. It was worn by pikemen and harquebusiers. We do not know whom Henry married, but we know he is the father of Charitie Vicarye. She married Henry Eyme alias Seale in Bishops Nympton in 1590. The marriage register states that she is the daughter of Henry Vicarye of Aishe raffe (Rose Ash). Henry was thus probably a young father around the time of the Muster Roll. The Rose Ash registers only go back to 1591, so we have no record of the other Vicarye children. In 1589 the will of William Vicarie of Roshashe als Asheraft was proved. If this was Henry’s father, he would have been a ripe old age by then. It is more likely Henry’s brother, the archer of 1569. The abstract of his will gives the names of the beneficiaries, but little detail about the bequests. It is thus difficult to form an opinion about his wealth and property holdings. He left bequests to the poor of Ayshraf and of Bishops Nymet, to my son Alexander £100 &c, to my son John Vicarie, to my wife’s daughter Julian, to my daughter Charity Tassell. He states that Thomas Takell owes him £7, and to Margerie Vicarie that he owes Robert Takell 40s. The residue of his estate goes to his wife Joan, whom he makes his executor. The rulers (overseers) of the will are Alexander Takell, my brother Henry Vicarie, and John Finn. Henry Vicarie was the “beloved friend” of George Southcombe, who founded the Southcombe line in Rose Ash and was the brother of our ancestor Robert Southcombe. George Southcombe was High Constable of Witheridge Hundred. He was killed in June 1595. when he tried to stop a fight on his way to Witheridge Midsummer Fair. His colt threw him and he was carried back to his house at West Ford in Rose Ash, where he made his will before he died. Henry was present as his deathbed. George made him one of the rulers and overseers of his will. Henry Vicarie was also one his four “beloved friends”, including his brother Robert, whom he requested to “have administration during my son’s minority”. There are five witnesses to this will. The second, after his brother Robert Southcombe, is Henry Vicarie. Another witness is Robert’s son Humfrye Southcombe. The link between the Vicarie and Southcombe families did not end there. A year later, in June 1596, John Vicarie married ffrances Southcombe in Rose Ash. Frances was George Southcombe’s daughter. Henry would have had a part in administering the provisions George had made for her. John and Frances Vicarie had a large family baptised in Rose Ash between 1597 and 1618. John was thus about the same age as Henry’s daughter Charitie. He may be Henry’s son, or the son of William Vicarie. His first two daughters’ names are Jane and Cibell. One of these may be the name of his mother, and possibly Henry’s wife. Given the repetition of baptismal names within families, though, it cannot be certain whether the John Vicarie, husband of Frances, is the son John mentioned in William Vicarie’s will, or Henry’s son. 1599 Vicarie, Henry 17 Dec.
Two years later, there is another burial. 1601 Vicarie, Johan wydowe 18 Dec. This is probably William Vicarie’s wife Joan, whom he names in his will, but could be Henry’s wife. The Elizabethan age was drawing to a close. Elizabeth died in 1603, to be succeeded by the son of the executed Mary Queen of Scots, James I of England and VI of Scotland. In 1620 there is a burial in Rose Ash for John Viccary, gent. We do not know if Henry Vicarie was ever styled as a gentleman. He mixed socially with the Southcombes, who were. It is very likely that he was at least a well-to-do yeoman farmer.